They are also alternatively know as filler beads as often times, they are used to fill up the length of a finished jewellery piece that may be using other more expensive or elaborate beads. Rondelle beads are also often used in the same capacity as filler beads. Also known as roundel bead or simply as rondelle or roundel. Rondelle bead is sometimes also incorrectly spelt as "rondell" or "rondel" - which are correct words in themselves but do not refer to the rondelle beads in the jewelry making world. Rondelle bead is a subset of the spacer/filler beads as they sometimes serve the same function. The word "roundelle" or "roundel" refers to the shape - a shape that is not a perfect ball, but rather a flattened ball or saucer shape. Rondelle beads can come as clear crystal discs, or encircled with chanel-set diamonds or rhinestones. 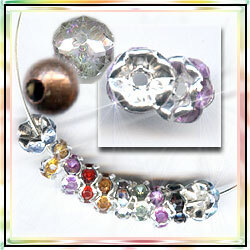 There are also rondelles made from gemstones, rhinestones, metals, hematite, crystal, glass, bone, etc. They are all called "rondelle" due to its shape. However you will also find similar flattened beads like these that are square or triangular. The square ones are called "squaredelle" but very often, they are just lumped together under the category "rondelles". And even though the roundel may be called "roundel bead", when shopping for them, you will often find them under (Jewelry) Findings rather than in the Beads section. Many new, fancy, and delightful rondelle beads are making their way into the market. These can really something extra to your finished items.